If you play a variety of boardgames then there is likely to be one style of game you prefer over others – whether this be “economic”, “worker placement”, “card drafting”, etc. Similarly there is likely to be games designers you prefer over others, usually by the fact that you have played one of their previous creations. It goes along the line “Oh they did _________ that I love to play, so I’ll probably like this new one by them”. It doesn’t always follow true and you will get a game designer trying something completely different that might just not be “your cup of tea” but more often than not you’ll like the new game if you like their previous ones. There are several Games Designers who’s games I enjoy playing and would pull an unknown game from a pile if I saw their name on it, but for now I’m briefly discussing Tom Lehmann. Tom wasn’t one of those designers (oh that sounds bad after “bigging it up”, so I’d best elaborate). The game, or family of games, that Tom is mainly known for is Race for the Galaxy and its expansions – his other games are not as well known. I’m a RftG fan, but hadn’t played any of his other games until 2010 when I pulled Phoenicia out of a pile of mostly unplayed games at a club to give a try and liked it. It was only after the first play (where we actually got the rules wrong!) that I twigged the designer was the same as that for RftG. I was then keen to give it another go, to get the rules correct, and ended up getting my own copy so I didn’t have to rely on the club’s. Another of Tom’s games is To Court the King, which was published in 2006 the year before both RftG and Phoenicia. I discovered this in 2009, though not as you may have thought from playing it, but because I was into re-theming games. One day browsing on BoardGameGeek I discovered a forum thread saying the theme was “pretty pasted on” and wondering if anyone had considered a retheme. There were a few suggestions but after reading the games theme background where “the players are petitioners at the royal court, trying to gain the King’s favor” it occurred to me that The Godfather might be a choice for a retheme. I’m not saying that my theme suited the game any better, just thought it was a good alternative. I got screenshots from the computer game (and got permission from the publisher for non-commercial use – I was just doing it for fun) did the graphics for a full deck of cards, including new iconography to make them relatively language independent. I made my own copy (via Artscow) put it away before moving on to something else. Did I play it? No, not at that time – lots of reviews said it was Yahtzee with added cards, and whilst I like dice rolling games wasn’t sure, there was much of a game. I have played it since and its a good short game that plays differently depending on the number of players. It has recently been implemented on Yucata board gaming site and become very popular there, so I’ll post about that later. Finally, to come full circle, I bought another game a few months ago, Starship Merchants, because (a) it was on offer (half price) on Amazon, (b) it sounded like a game I’d like, and last but not least (c) because Tom was a designer for it. So whilst I wasn’t initially aware of many of Tom’s games it does seem that he does design games I like, so in future it will be one of the names that may sway me towards trying an unknown game. I do seem to be spending a lot of time on Yucata, but then they do keep implementing more games. 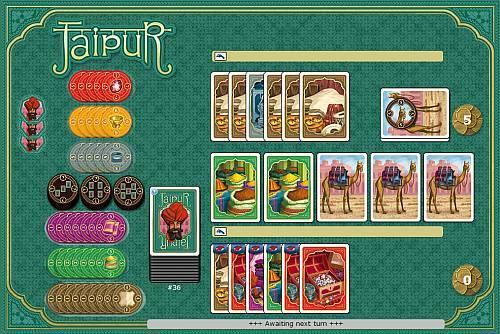 The latest game to enter Beta stage is Jaipur a 2-player hand management card game about becoming the Maharaja’s personal trader. It seems a fairly light game and I’m playing a few games so should be able to give a review in a week or so. Although it sounds like a “matter of fact” statement, announcing a game has reached Beta stage is quite an achievement. Firstly lets remember that Yucata is a free games playing site – free to join, free to play and free from adverts! Secondly the games developers are doing it in their spare time, unpaid, so they have the dedication. The process, I believe is something along the lines of this: Games are identified as suitable for asynchronous play-by-web and make a good addition to the games on offer. The publishers are then approached to seek a license, and if granted the game is given to a developer, who is someone who’s offered their services to Yucata for free. Some time later (I think the developer goes off and eventually comes back with something they are happy to progress to beta) it is implemented onto the site, marked at “in beta” and announced on the site to members and all. Most games I’ve tried in Beta are usually bug-free, though the occasional one pops up, what seems to happen is the implementation is tweaked after user suggestions to improve game play. Just the same as having a document proof-read by someone before final submission. After the game has been played a while and people seem to be happy with it, the beta flag is removed. Targi is a game by Andreas Steiger released in 2012 by Kosmos as part of their 2-player series. It’s released in German, but Z-Man will be releasing an English edition in 2013, which is important as there is extensive text on some of the cards. I’ve been playing the online implementation of the game, so the card texts are in English (can also be in German if you prefer) so making it easier for me to play. A quick overview of the physical version based purely on photographs – in the box you get a pack of cards, 11 wooden figures and a bunch of resource chits, which might make you think its a card game. It is a board game just that it comes without a board, instead you have a modular board formed from the cards. I wonder if it was a cost saving exercise, or done by design? The board is formed by 16 cards laid out to form the edge leaving a 3 by 3 space in between to lay cards which may be claimed and replaced each round. Does the board tend to get disrupted as players take cards – you can’t tell by playing the online version, but it does make you wonder as I have gaming friends who find picking cards up challenging! I shall post with a review once I’ve played several games.